Second Facility Doubles Manufacturing Floor | KLH Industries Inc.
For the fifth time in its history, KLH Industries will double its manufacturing square footage. For only the first time, though, KLH will operate out of two buildings simultaneously. 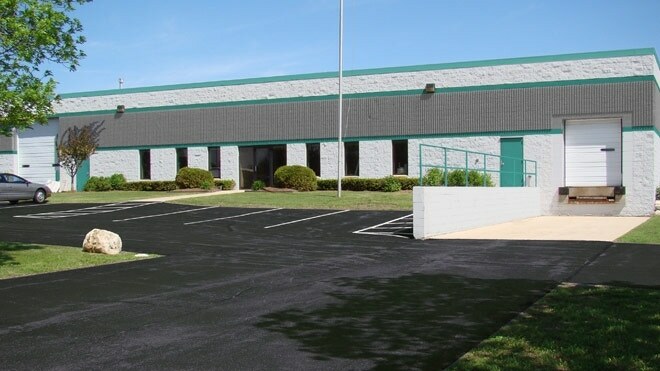 In April 2011, KLH purchased a 15,000 square foot building on Fulton Drive in Germantown (pictured above), a mere 120 yards from its existing facility. The new building is currently being renovated to meet power, air, weight, and safety requirements, but is scheduled to be occupied and operational in mid-September. Additional manufacturing floor has been a reoccurring concern for CEO/President Ken Heins, who described KLH's current floor plan as "resourceful." "KLH was out of space three years ago," says Heins, "but the economy made it very easy to move sideways for awhile. I realized how important it was not to get stuck in that survival mentality." Instead Heins thought about growth. The purchase of a second facility creates breathing room for all of KLH's departments – EDM Machining, CNC Machining, Waterjet Cutting, & Dimensional Inspection. Yet none more so than the CNC department, who's manufacturing floor alone will increase over 180%. "This is the best possible solution for all of [KLH]," says Operations Manager Joe Mingari, "There's a lot of communication that goes on between the departments, so it was important to find a suitable location that can meet our current and future needs." The entire CNC department will be relocating to the new facility, to better house a growing department. "The Puma 480 lathe (purchased in Feb 2010) takes up a lot of space," says CNC Manager Steve Cruz. "Not just the machine, but with 80" of z-axis, the parts are taking up a lot of space too." To maintain the throughput of aerospace components, and other contractual dimensional inspection, the second building will also have a temperature-controlled quality lab. Both facilities will continue to carry ISO 9001 and AS9100 certifications; a sign of the unfaltering quality control throughout the moving process. Combined with the upcoming Nadcap certification and new ERP system, the better question isn't what will KLH do with the additional space, but how long will it last?